When you are thinking about building a website, there is two question arises in your mind. Whether you should use a CMS or you should create your website using only HTML and CSS. So there are so many CMS available in the market if you don’t want to stick with coding. In this article, I am talking about Joomla CMS, and it's best to free multipurpose templates that can make your website more professional, clean, mobile friendly and fast. So let me tell you why you should use Joomla as your website CMS. • The Admin area is so fresh and easy to manage everything. • The default template is so stunning. • It has a great supporting community. I think this is enough to explain to you why you should use Joomla for your next website. Now it comes to choosing a template for your site. There are a lot of Joomla templates provider which are providing free and premium templates for you. But you need to know how to choose a best Joomla template when you want it for free. JD New York is a multipurpose Joomla template launched by JoomDev, which can be used for any website. If you want to create a simple business or portfolio website, it is the best choice for you. It is also the best one template even if you want to setup an online store, a discussion forum or a calendar event manager. More than 20 Content sections on the home page. • Free for Commercial and Non-commercial use. • It is fully mobile friendly. • Inbuilt Virtue Mart, Kunena, Jevents, K2, and Hikashop. • More than 18 professionally designed content sections on the homepage. Force1 is a multipurpose Joomla free template launched by JM-Experts. It is entirely responsive with each and every screen and can be used for any type of website. This free clean Joomla theme features social networking icons, a slider, a responsive layout, Twitter integration, a newsletter subscription form, and more. JSN Dona a great multipurpose Joomla template designed by Joomla Shine team. They gift this template on the occasion of 10th birthday of Joomla! It is a neat and clean, professionally designed template available for the commercial and non-commercial purpose. • Built in 6 Home page layout for different categories like politics, religion, charity, education, business, or portfolio. • Powerful features like a multimedia slider, multipurpose form, google map, countdown timer and much more. • 36 module positions, 40+ parameters, 06 module styles for flexible layout configurations and more. JSN Venture is another multipurpose template launched by Joomlashine team. It is fully loaded with impressive features like a slider, page builder, image gallery, form builder and much more. • Compatible with each and every browser. • More than 3 template layout. OS Section is a free multipurpose Joomla template that can be used to create various types of business, corporate or marketing sites - agency, portfolio, photography and blog websites. The fully responsive layout works perfectly on every screen. Section multipurpose Joomla template comes with portfolio page, responsive gallery, Google location map, advanced typography features, a blog and contact us form. JF Connecto is Free Responsive Multipurpose Joomla! Template. It is well suited for any websites, corporate, business, portfolio or social websites. This beautiful Joomla! The template is based on Powerful Gantry Framework with lots of features and with rich typography elements. It also supports 3-rd party extensions, such as are EasyBlog and EasySocial. Tendo is a free Joomla template which can be used on any kind of website. Its flat, clean and responsive layout can make your site more professional and beautiful. It is fully loaded with unique features like advance admin design, mega menu, built in SEO feature, responsive layout, custom short codes, universal font codes and much more. • Revolution slider included, so you save $25 and much more. Radon is a clean, modern design multi-purpose Joomla template can be used for any type of professional and modern websites. It fully equipped by latest technology such as Bootstrap, HTML5/CSS3 and Mega Menu built-in. Developed by JoomDev, JD Dallas Joomla 3.7 template features a modern minimal design with a breadth that can span several fields. While targeted towards agency, Studio, Portfolio and also well suited for product based websites. 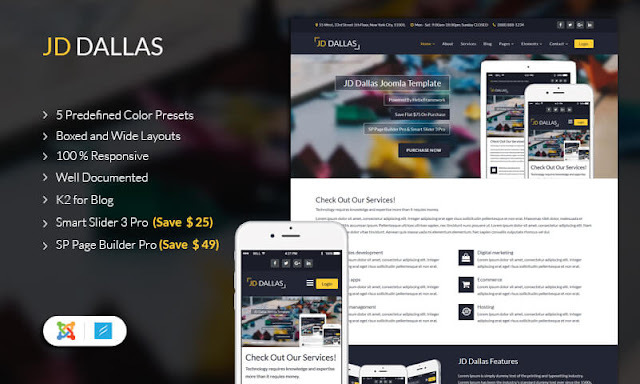 JD Dallas based on Helix 3 framework with Bootstrap, JD Dallas support CSS3 effects, plenty of typographic options, many module styles & positions, and a highly flexible Width & Boxed layout. JoomDev has built a proud name in the Joomla template building world & this free/Paid Joomla template bake that knowledge into a highly flexible, multi-purpose Joomla template. 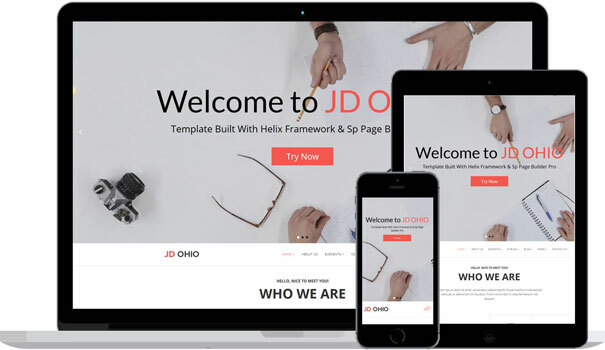 JD OHIO is the new clean and extremely modern Business Joomla 3.7 template, designed for Agency, Studio, Corporate, and Business website. Last but not least, it features SP Page Builder, a tool that will help you create your unique pages and represent personal vision on your web space! Our best experts create this Joomla template, so it will leave your business no possibility yet to wind up noticeably fruitful! Let everybody realize that you're willing to change the world advantageous! Also, our bolster group will be no more remote than a single click away on the off chance that you require any assistance! Some 3rd party extension included like Smart Slider 3 Pro (Save $25), SP page Builder 3 Pro (Save $49), K2, many other. Naveen is a blogger by hobby and SEO by Profession. Along with Blogging and SEO, he is also an active member of TEDx WalledCity Team.He blogs at F5 The Refresh.